Wissota Sand & Gravel is a third-generation, family-owned business that has been going strong for more than 95 years because we offer only the best in quality aggregate products. Our products are in compliance with all local, state, and federal regulatory standards and meet ASTM International and Wisconsin DOT specifications. 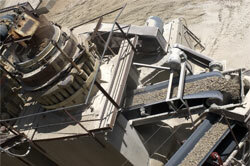 Our products also pass the Alkali-silica reaction of aggregate standards. Our piles of products are homogenous, which means they are all the same spec. The benefit to our customers is you'll always receive the same great quality products - without worry. In addition to outstanding standards of quality, our long-term customers return again and again because we provide dependability, professionalism, and prompt service. This is how we've built our business, and how we will continue our success.